Using the 2001 Canadian Census reports, the City of Vancouver BC is estimated to have a population of 582,045. Lending to Vancouver BC's feeling of fun, youthful vigor and nighttime excitement, 35% of the total population is between the ages of 25 and 45 years old. 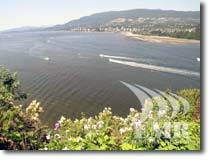 The whole of Greater Vancouver British Columbia's approximate total population in 2001 is 2 million which is 49.5% of the 4.1 million population of province of BC. Vancouver BC is fortunate to be located nestled between the Coastal Mountains and the Pacific Ocean. Since the normally harsh Canadian winters often include sub-zero temperatures in both celsius and farenheit, Vancouver BC has the distinction of being the largest Canadian city without having to suffer the injustices of a freezing cold winter. Since the currents of the Pacific Ocean keep the temperatures of Vancouver a constant and temperate average, and the coast mountains protect Vancouver BC from the harsh weather from just on the other side of the range, Vancouver BC enjoys surprisingly mild temperatures all year round. In the summer you can expect an average of around 70-75 F or low to mid 20 C to a wonderfully temperate mid 40's F or 0 to 5 C in winter. In winter you can expect quite a bit of precipitation to fall. Though in the city this falls as rain, less than 20 minutes from downtown Vancouver BC, you can watch this precipitation fall as snow on some of the local ski mountains. It is easy to say that the best time to visit Vancouver BC is any time but it would not be untrue. Summer brings outdoor music, arts of all kinds and festivals, walks, water sports and golf. As with the amazing weather, Vancouver BC also does not suffer from the plague of biting bugs that invade the rest of Canada. 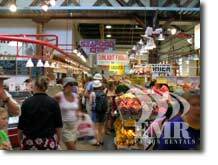 Enjoy all of the outdoor attractions, or just simply enjoy the beach after spending some time shopping in one of the many famous merchant areas of Vancouver BC. Spring brings early February flowers and beautiful mists off of the ocean. Fall is a spectacular time in Vancouver BC, beautiful weather combined with salmon fishing and many music festivals makes for an excellent season. Winter allows for some interesting experiences. Enjoy the beach for a walk in light clothing before breakfast, head to one of the local ski mountains for a morning ski and after lunch, you can do some golfing. All this is possible thanks to the climate of Vancouver BC. 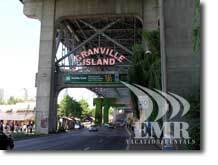 Need some Inside Information on Vancouver BC? There are some excellent sources for what is going on in Vancouver. We have provided a few for you here, ones that we feel are the most helpful. Call (604) 684-2787 for the latest information on performing and visual arts events in and around Vancouver BC. You can talk to a live person Monday to Friday, 9 a.m. to 5 p.m. PST. The Arts Hotline is a service of the Alliance for Arts & Culture, 938 Howe St. at the corner of Smithe, home of the Arts Info Centre. Drop in Monday to Friday, 9-5 p.m.
CBC Radio is Canada's national radio station. You can find it at 690 AM for commercial free, public radio with local programming morning (6 to 9 a.m.), noon and afternoon (4 to 6 p.m.). On the Canadian broadcast from 6:30 to 7:30 p.m, you can listen to "As It Happens", a look at the day's news. To contact the CBC, you can call (604) 662-6000 or visit www.cbc.ca. No other city publication knows more about Vancouver than the Georgia Straight. Established as the lifestyle and entertainment weekly in Vancouver for over 30 years, the Georgia Straight is an integral part of the active urban West Coast lifestyle with a per issue readership of almost 340,000. Every Thursday, the Georgia Straight delivers an award-winning editorial package of features, articles, news and reviews. Regular weekly coverage includes NEWS, ARTS, MUSIC, MOVIES, FASHION, TRAVEL, BUSINESS, HIGH TECH, FOOD and RESTAURANTS, plus Vancouver's most comprehensive listings of entertainment activities and special events. Throughout the year, the Georgia Straight also produces a series of reader polls covering a variety of interest that are entertaining and informative. The Georgia Straight is located at 1770 Burrard Street, 2nd floor. You can phone (604) 730-7000 for more information or visit www.straight.com. The Vancouver Sun is the major Vancouver BC newspaper, published every morning except Sunday. You can find a complete entertainment section every Thursdays. The weekly TV Guide is found on Fridays. Call them at (604) 605-2111 or visit them at www.canada.com. Vancouver British Columbia is well known as the third largest movie producing location in the World. Thanks to this, Movie Stars abound as does the opportunity to view many different types of movie sets. What famous people frequent Vancouver? Well, Oprah has recently been rumored to have purchased an exclusive west Vancouver Mansion on the Ocean. Jeff Goldblum has been spotted playing the piano at a downtown lounge. Robin Williams frequents a Chinese restaurant on Burrard Street. Gwyneth Paltrow, Barabra Streisand, John Travolta, David Bowie, Goldie Hawn, Arnold Swarzenegger, Eddie Murphy, Sean Connery, Mel Gibson, Tom Selleck, Brian Dennehy - they've all been here or live here. The film industry injects more than $1 billion dollars into the local economy. Movies, TV series, made for TV movies, it all happens here. Keep your eyes peeled for the requisite big white trailers parked on city streets with a lot of busy folks running around working morning, noon and night. Or you could stake out the lobby of any chic downtown hotel and perhaps catch a glimpse of your favourite star. To see what movies or TV shows are in production in Vancouver, call the Hot Line (604) 660-3569 or visit the BC Film Commission site and download their PDF Film List.